I want to thank all of you so much for your kind emails and warm words of support and love over the past few days. Frankie died in my arms at around 2:00 AM yesterday morning. If you read this page with any regularity, you'll know what a devastating goodbye this was for me. Frankie was my most beloved companion, my very best friend, and the absolute light of my life. And if you think it's unseemly for me to describe a dog this way, it's just because you never met Frankie. Everyone adored him. Throughout his life, no matter where I went with Frankie, total strangers would stop me and ask about him. He had an uncommon gusto, an industriousness and lust for life that were apparent just in the way he carried himself. He was an incredibly happy-go-lucky dog and he absolutely radiated joy. 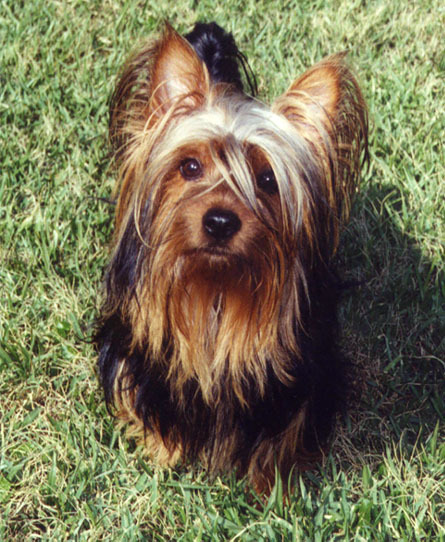 Frankie came into my life at an especially difficult time, when I was inconsolable over the loss of my first dog, a Yorkie named Samson that I'd had for 13 years. When I lost Sam, I thought it inconceivable that another dog could ever fill the void he left in my heart. Frankie, a gift from my then-fiancée, Mark, disabused me of that notion in short order. 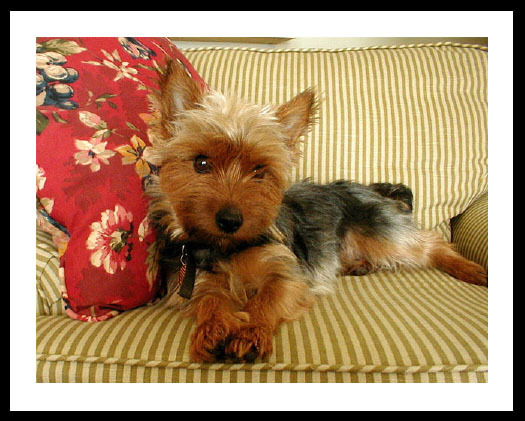 For such a little dog, he was a huge presence, and in no time, he eased our grief, filled our hearts, took over our household and made himself the very center of our lives. When Mark and I split, it was Frankie who got me through the heartbreak, and I've often thought that our shared love of this special little dog was one of the things that enabled Mark and I to remain on warm and friendly terms even after the end of our romantic relationship. There've been other rough patches in recent years, times when life felt so cold and unwelcoming that it was only Frankie who gave me a reason to get up in the morning. I've always known that in some very fundamental way, I needed him as much as he needed me. He kept a smile on my face and hope in my heart through tough times that might have felled me otherwise. When I moved from New York City to Louisiana in 1999, Frankie made the transition from "city dog" to country dog with aplomb. My mother's dogs, a yellow Lab named Kady and a Lab-Chow mix named Butch, are both about 4 times Frankie's size, but he wasted no time in insinuating himself into the pack and letting both dogs know that he wasn't going to be bossed around. My shop is on my mom's property, and Frankie went there with me every day; while I worked, he had the time of his life romping with the big dogs. He was a very sociable dog and it was wonderful for me to see him displaying "pack" behavior for the first time in his life, the level of sheer pleasure he got out of being "one of the gang." When my mom was handing out treats or scratching her dogs' backs, Frankie was always right there in line, waiting his turn. We laughed at the way he bellied right up to Butch and Kady's humongous food and water dishes  which were practically as big as he was  and ate and drank his fill as if he owned the place. When Mom's vet prescribed ear drops for her dogs, she had to pretend to put drops in Frankie's ears, too, because he awaited his turn so expectantly that we knew he'd feel left out otherwise. Frankie stuck to me like glue; at home, he always wanted to be in the same room I was in, and he was rarely more than a few feet away from me. When I went anywhere in the car, he was usually riding in the passenger seat  either that, or sitting in my lap, looking out the window with his head slung over my arm. The clerks at the neighborhood bank, the barbecue place and the drive-through pharmacy loved him and usually had treats waiting for him when we drove up, and before long, going to these places was one of his favorite rituals. Any business I had was secondary  as soon as we approached a drive-thru window, he'd jump into my lap and wait impatiently for me to roll the window down, then climb up onto the edge of the window to greet the clerk and accept his treat. In his mind, this was the whole reason for the trip. I was just the chauffeur, driving him around to see his friends. He was absolutely fearless; I can't think of anything he was afraid of. When it was storming outside and my mom's dogs were cowering behind the couch because of the thunder and lightning, Frankie would be going about his business as if to say, "Jeez, it's just a storm, guys, get over it!" Occasionally he would be cautious about approaching unusual objects, but his curiosity always won out in the end. He could climb like a monkey and he jumped as if he thought he could fly  we had to be careful, when putting things out of his reach, that they were really out of his reach, because he could be incredibly resourceful. We were always walking in to find him standing on end tables or the backs of couches. He could climb halfway up the chain link fence if a neighbor dog happened to get too close to "his" yard, and when my mom put up an indoor dog gate to keep the pooches out of the back rooms of her house, Frankie learned how to open the latch in no time. He had a hedonistic approach to food and would eat virtually anything. He adored fruits and vegetables, something I've never seen in another dog. When I trained him as a puppy, instead of the usual dog treats as rewards, I used diced red bell pepper, one of his favorites. I wouldn't dream of eating breakfast every morning without pulling a few blueberries out of my yogurt for him. If you held an ear of corn on the cob for him, he would eat it just the way a person would, with his lips pulled back, typewritering from end to end with his front teeth to get every last kernel. In all the time I had him, the only food I ever saw him refuse to try was Jello strawberry pudding. Everything else, he wanted a taste of. He always wanted the full experience. He was the most toy-oriented dog I've ever been around. He just loved toys, especially stuffed animals. I kept his huge collection of toys in a corner of the bedroom, and he never lost interest in any of them. He rotated them, playing with different ones every day, and selecting a toy from the pile was very serious business for him  it always took him a few minutes of poking around to find just the right one. Often, he would be in the living room, lying in his favorite chair watching TV, and suddenly sit up as if there was a light bulb over his head. Then he would trot busily out of the room and return a few minutes later with a favorite toy, as if he'd just decided out of the blue that he really needed to go get it. I would constantly find him asleep with his chin resting on one of his stuffed toys. He turned into Wild Man Psycho Dog any time he got wet, either from a bath or having to go out in the rain. He would wait calmly for you to dry him off, but as soon as you stopped, he would take off running at breakneck speed, tearing around the house in manic circles, dashing up and down the hallway and galloping around the furniture with his ears laid back and a manic grin on his face. I have never seen a dog look so silly. He behaved as if anyone who came to my house had come to see him. Nobody could come through my door and ignore Frankie  it just wasn't done. My friends and family knew that if they wanted to visit me, first they were going to have to spend at least ten or fifteen minutes with Frankie in their laps, dragging out toys for them or nudging them with a paw and trying to get them to play. He was so exuberantly happy to know everyone. Frankie was only 6-1/2 years old. I had expected to have so much more time with him. There were no outward symptoms that he was sick until 2 days ago, when he stopped eating or drinking and began showing signs of pain. By the time we knew he was as sick as he was, it was too late. He was treated by his regular vet Tuesday morning, and at that time, the vet told me he suspected a kidney problem. He said that it was very serious but not critical. He did a blood workup, gave Frankie subcutaneous fluids to hydrate him, and told me to bring him back the following morning. Frankie seemed to be doing a little better that afternoon, but at around 1:00 in the morning, I noticed a rasp in his breathing that hadn't been there before, and my mother and I took him to the emergency veterinary hospital. The vet examined him and then left the room to look at x-rays and blood test results. I was holding Frankie in my lap, wrapped in a red towel. He had been sitting quietly for a few minutes, but then he moved, turned his head to look at me, and took a long, slow breath...and I knew. My mom called for the vet, but by the time we had moved Frankie onto the table, he was gone. I still can't believe it. I miss him so terribly...he gave my life a focus and center that are glaringly absent now. Today is a little better than yesterday, and I know that tomorrow will be a little easier to get through than today, but the house is so incredibly silent. Every morning, for the past 6-1/2 years, Frankie has been there to greet me when I woke up, and every night as I've gone to sleep, he's been there curled up beside me. It's almost surreal trying to go through my daily routine without him around; I keep looking in all of his favorite places  the pillow in my office, his favorite chair in the living room  and expecting to see him there. I keep listening for the jingle of his tags. He was such a wonderful, wonderful friend. This one is going to be hard to get through. I'm going to be out of commission for at least the rest of the week, but I wanted to write something here to let you all know what had happened. Thank you all so much for the concerned emails you've sent. It means an awful lot to me to know that Frankie had so many people around the world pulling for him, and that I have so many caring friends. Thank you, sincerely. I'll see you sometime next week.